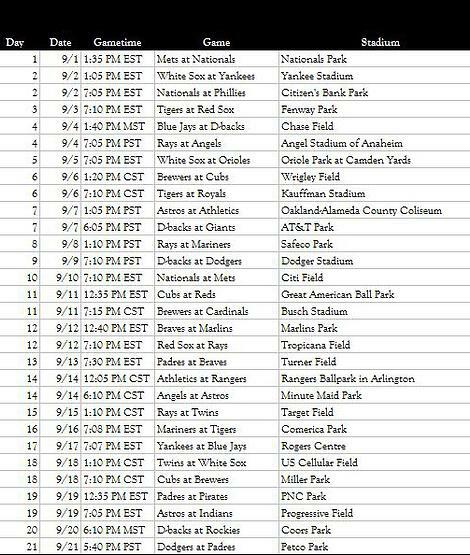 The schedule of Jake Beham, who is trying to chase down my World Record of Seeing all 30 MLB Parks (every pitch) in 23 calendar days or less. This schedule must have been done without knowing you have to witness all plays of the game to qualify. Jake is going to have a tough time dodging a miss on day 2 – where he will try to beat Labor Day Monday traffic from after the game – in order to make 1st pitch at CBP. He will never make it by car. The Yankees always play games that are 3 Hours or longer as well. Even Amtrak train is a longshot. I give him a 10% chance to make it on his 1st Doubleheader attempt. 2 days later he flies to Chase Field – and has scheduled a Doubleheader with Angel Stadium For DH #2. I am assuming he is planning on taking a Southwest Airlines flight that arrives at John Wayne Arpt. The flight leaves Phoenix at 455 PM. That is 4 hours and 15 minutes after 1st pitch. The flight that arrives in SNA at 605. If he makes the flight, he could make this. However it is about a 67% chance. Most NL games last about 2 hours and 35 minutes. The airport is close enough to the park in PHX – as is SNA airport. Any extra innings though, and it is over. On FRI, Sept.6th, he has scheduled a Wrigley Field and Kauffman Stadium doubleheader for DH #3. This one is impossible. The game starts at 120 PM local Chicago Time. The closest flight I saw that leaves ORD or MDW in time for Kansas City, leaves at 441 PM. That is 3 hours and 21 minutes from 1st pitch at Wrigley Field. The days of not being able to visit all MLB parks in consecutive days ended in 1993, when the Rockies were introduced, and enhanced even more with the Arizona Diamondbacks entering the league in 1998. 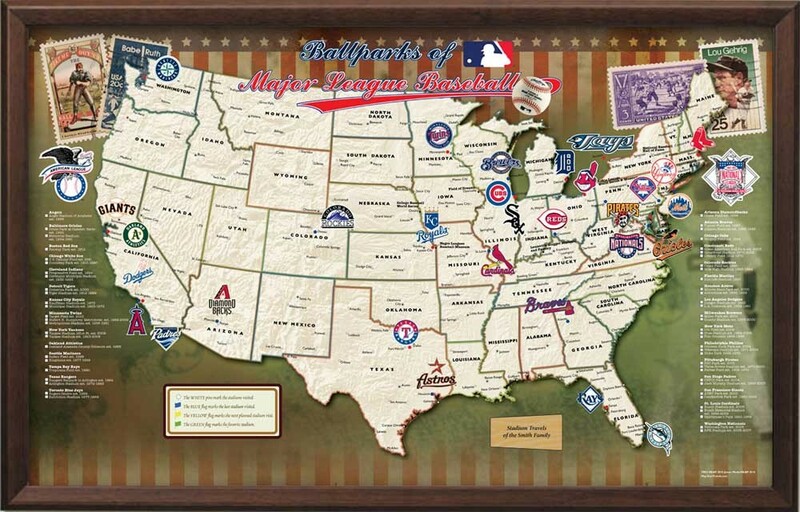 In the last 15 years, several people have tried to see all 30 MLB parks in under a month. Some successful, some broke some rules, and one guy even bought this website 6 months after he set the World Record for visiting all 30 MLB Parks in just 23 Calendar Days – completing 7 Doubleheaders. Ballpark Chaser definition: Someone who is actively pursuing quests to view Baseball Parks. Guys talked about in this Article: Completely Insane! By Josh Robbins (Special Guest Writer And Co – Creator for The Factor12 Rating Pitching Metric.) Factor 12 (F12) is an analytic measurement utilizing league average performance to compare the value of all MLB pitchers on 60ft6in.com. Twenty years ago, the course of history changed for ballpark chasing. In 1993, the Colorado Rockies and Florida Marlins debuted in the National League, increasing the total number of MLB teams to twenty-eight. The two new franchises created positions for fifty players and expanded the pursuits for ballpark chasers. In prior years, the nearest connection between a west coast team and the mid-west was Anaheim Stadium to Royals Stadium, a 23-hour drive covering 1,619 miles. As a result, it was impossible for fans to attend games in consecutive days at every MLB stadium during one concurrent driving trip. Consequently, the only method to complete the entire circuit was to combine land and air travel. The new league structure dramatically altered the traveling landscape by adding Mile High Stadium in Denver, a 14-hour, 1,011-mile drive from Anaheim Stadium.